Last updated Oct 2016. (Patched) means something is no longer true. A great new feature to Gardening, grafted plants will yield produce from all its parts. With the increased variety of plant types in Sims 4, taking care of one of each type can be time consuming (especially without sprinklers). Spliced plants allow you to have all of the produce types without having to have one of each plant. Grafting unlocks at Gardening Level 7 and is a requirement for the Freelance Botanist Aspiration. (Outdoor Retreat) See the Herbalism page. (Get to Work) Baking: Blueberries = Blackberries. ♥ Plants can be placed in your household inventory, so you don’t have to keep maintaining them unless you want the produce. ♥ Planters come with the base game, allowing you to grow plants indoors. ♥ You do not have to plant each produce individually. As with watering/weeding/spraying, selecting “Plant” on one seed will get your sim to plant all the seeds on the lot. At Gardening Level 7, along with grafting, you gain “Tend Garden” – which will spray, water and weed all your plants. Produce can be tiny and hard to click to plant; if this annoys you, use planters. Clicking on a planter brings up “Plant”, “Tend Garden” and “Purchase Seeds”. Fertilising only helps with getting your plants to evolve. Once they are perfect, you no longer have to keep them fertilised. Many plants can be found through Fishing. If you have a Microscope (for Logic skill), you can take a sample from any plant. Your Notebook can be found on your computer and on your phone (tiny icon on the top row). Notes are by sim (not by family). Only the first combination will show up in the Notebook. If you discover Pomegranate via Apple+Cherry, splicing Apple+UFO will not show up in your Notebook (but the plant will still produce Pomegranate). Pretty sure I’ve tried every combination (in the base game), but due to the thing above, might not have listed them all. (Get to Work) Using the Chemical Analyzer to “Analyze Flora…” may reveal splicing recipes. It may also improve the quality of your produce. ♥ Super Green Thumb (4,000) – Revive dead plants; extends time between watering, etc. ♥ Free Services (1,500) – In spite of the tool-tip, full time gardeners are also free. You can also form a Group and “Tend Garden Together”. If you take a cutting from a spliced plant, it will be treated as a single plant (the first on the list), so you cannot clone spliced plants and have to create each one individually. You cannot cut or graft with the Cowplant, Mushrooms or Bonsai. The grafted plant starts over with its current quality. Harvest first or you will lose whatever produce the plant currently has. Since trees produce fruits slower, if you want speed, it’s best to graft fruits onto a fast growing bush (not all bushes grow fast). The Cowplant functions much as it always has, except interacting with it now raises Gardening. Cowplant Berries can be spliced with Snapdragon + Dragon Fruit. Cowplant Berries can be found via Fishing and Rocket Ship missions. I found many Cowplant Berries fishing in Oasis Spring Park (near the mine) and in Sylvan Glade. The Cowplant has Playful Decor: 2. You cannot Take Cutting or Graft. Unlike normal plants, it does not have mood or quality displayed. If moved to the household inventory and mouse-overed, it does display quality (normal). 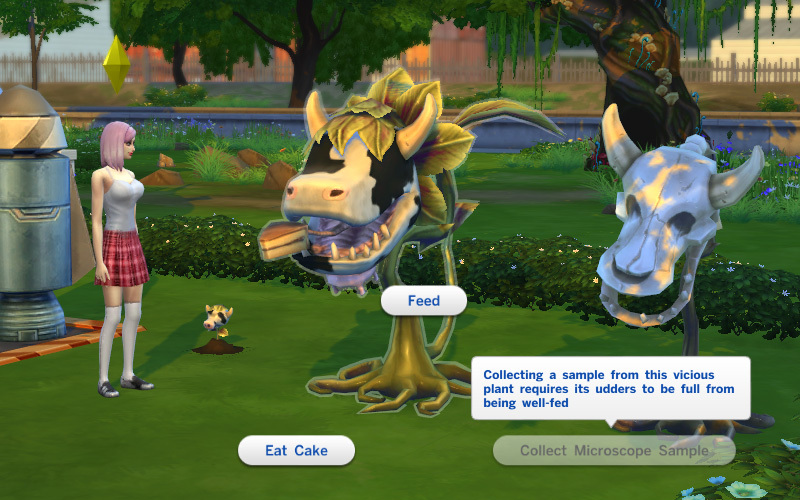 To get a Cowplant to eat a sim, don’t feed it until it reveals its lure (delicious cake). ♥ The sim dies – Essence of Life, adds days to lifespan (Happy +3/2days). ♥ The sim lives/is in a mood – Essence of Mood (Essence of Sadness, etc), mood +2 for 12 hours. ♥ The sim lives/is not in a mood – Cannot be milked. ♥ The Essence comes in a glass, like a potion, so you can save it for later. ♥ If not milked, the Cowplant will not starve for much longer. If you want it for decoration, don’t milk it. Death by Cowplant is not random. Once a sim has been eaten, she will be Drained (Uncomfortable +1/2days). A sim will only die if eaten while Drained. You can create an Essence of Mood every two days perfectly safely. Great for drinking before going to work. 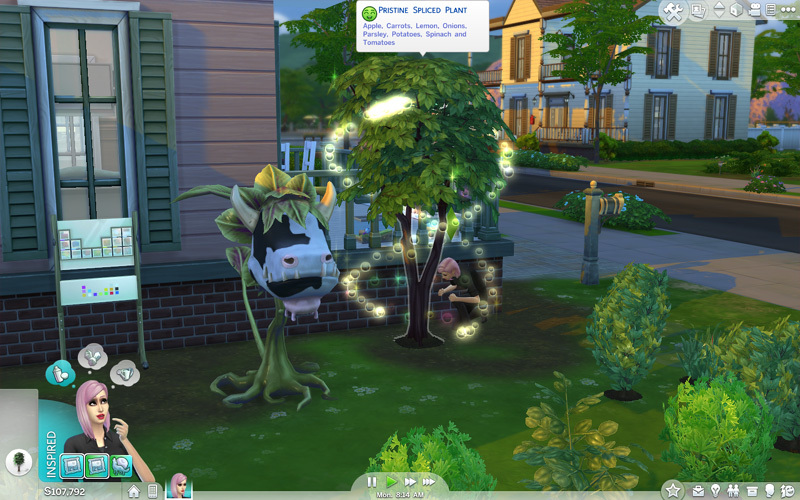 Put the Cowplant in Household Inventory after its lure is out if you can’t Eat Cake then. (Get to Work) Temporary ghosts cannot eat the cake-lure. Guests formerly would not Eat Cake, but they do now. At launch, I tried all sorts of things. The only way appears to be to Move In your victims and… Chomp. I miss the Sims 3 Cowplant, which used to eat paparazzi. I never liked paparazzi until they became a food source. So Retail and Clubs or even Social Events can fill your Cowplant. Interacting with the Bonsai Tree (Activities and Skills) raises Gardening and gives Focussed. A Bonsai Shrub grown from Bonsai Buds can be converted to a Bonsai Tree (same as the buyable one). This can only be done when the Bonsai plant is at Excellent level (no higher). If, like me, you’ve been grafting everything so all your plants are Perfect – find either a wild Daisy or Strawberry, harvest and plant it, then graft. If you’re going to a lot for the first time to look for a plant, wait a few seconds before pausing to search the map. Plants need that time to spawn. It’s best to wait till Gardening Level 7 before you go looking for wild plants you don’t have. With “Take Cutting”, you don’t have to wait for a plant to bear fruit, just take a cutting and graft it at home. It will also be of the quality of the grafted on plant, so this is a quick way to have perfect plants, rather than evolving each type individually. (Get to Work) = Max Rocket Science/Max Scientist Profession, (Get Together) = Windenburg (Von Haunt Estate), (Outdoor Retreat) plants are used in Herbalism. I spliced plants of types. The first name is the base plant. These are not optimised for speed, I choose them because they look different. ♥ (Patched) You can no longer eat produce. ♥ (Patched) Cuttings you take from plants not on your home lot will show up as “plant cuttings” (without the plant type) when you return home. Just go ahead and graft them, they still remember what they are. ♥ (Patched) Plantain (banana) isn’t listed in the Collections list. ♥ (Patched) Orchid: Complete the Space Rock Collection; it will come in your mailbox. ♥ (Patched) As of 18th Sept 2014, grafting plants to create new species does not work. This will hopefully be patched as it seems to be an intended feature (I got the Achievement for it). You therefore cannot complete the Collection. ♥ (Probably patched) I encountered a bug where my sim would graft and the plant wouldn’t be spliced. As far as I can tell, if this happens you will have to start over. Only happens with Sage. Contributions from jaleenicole and einalem58 via reddit. Facebook comments below.